I was thinking about Valentine’s Day recently and how much I used to hate the holiday. I will admit now that it was partially because I was bitter, but also because I went through a punk rock rebellion when I was younger. I hated how much commercialism was involved with a holiday that was supposed celebrate pure emotion. I also never really got the big deal about using one day a year as an excuse to shower people with love (and presents) when you could do that 365 days out of the year. I still don’t understand that. Then I met my husband, my permanent Valentine. Once I moved in, I couldn’t wait to decorate the house! Since I’m in the middle of reorganizing our attic, my bins of decorations are a bit of a mess right now. But there’s one thing I’ve determined going through my bins – I don’t have a lot of Valentine’s Day decorations and the ones that I do have, I’m not completely fond of. So I’ve been making an awful lot of my Valentine’s Day decorations this year. One thing that I didn’t have was something for our front door. I didn’t want a big, red wreath, so I set out to make my own door decor. Reds and pinks are so symbolic of Valentine’s Day, but I decided to go a non-traditional route with black, white, and gold (can you tell from my blog that it’s one of my favorite color combinations?). If you’re a Valentine’s Day hater, like I used to be, you won’t have to worry about any Pepto Bismol pink in this project! Of course, if you want to shoot for a more traditional color combo, go right ahead! Spray paint your wooden letters white on each side. Allow each side to dry before continuing to paint. To create stripes, use painter’s tape to line out your design on your letter. Paint in between the painter’s tape with black paint. Allow to dry. 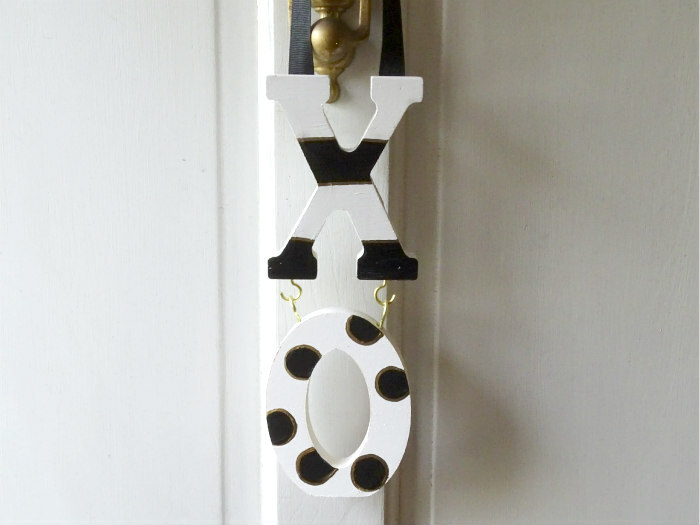 Use a mini pouncer to create a dot design with black paint. Allow to dry. Add a gold accent using gold paint marker on each stripe or around the polka dots. Next, measure where each cup hook will be inserted in each letter and mark with a pen or marker. Screw in each cup hook until it’s nice and tight. Determine how long you want your ribbon to be and cut it to the desired length. Attach the ribbon to the top of the X using black thumbtacks. 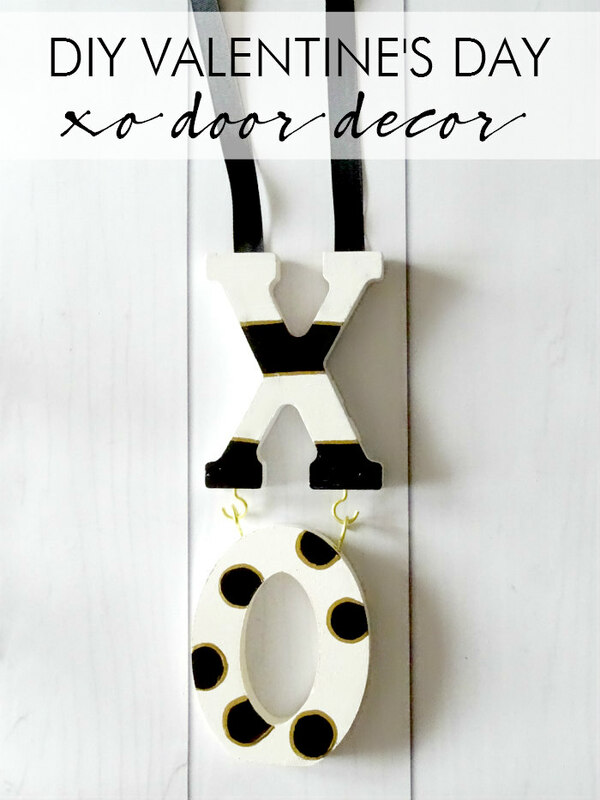 Hook your X and O together and display on your door. You can find all of the supplies for this project and all of my DIY projects on Darby Smart. Use code zdmmzh25 at checkout to save 25% on any of my projects! Discount is valid until 1/21/16. Do you feel “XO” or “hell no” about Valentine’s Day?